Gas is not getting to the regulator on my 1988 Saturn T-1350. I leak tested everything and did a test burn on all gas appliances a few weeks back. All worked well - water heater, range, and furnace. This morning, I couldn't get anything lit. It had gotten to 27 this morning, but was in the 30's when I tried to run the furnace - and it wouldn't light. No stove either. Plenty of pressure on the gauge. Upon inspection this evening, the gas was not getting to the regulator. It was getting through the hose, but not past the fitting at the inlet of the regulator. It looks like a spring-loaded valve with the spring pushing back towards the tank. When I found it, it was stuck with the spring compressed. What's its function? This is the fitting on the end of the hose, inlet fitting at the regulator. With the age of your camper, odds are favorable that someone may have changed the regulator when the new tank gas fittings came to be. I'm assuming you no longer have the tanks with the left hand all brass nut? Also do you have an auto switch over regulator and 2 LP tanks? I do not know exactly what you have on your camper or if it was changed since new. This vintage is the newer 2 stage auto change over regulator. It is feed by 2 tank hoses that have the newer style plastic ASME nuts to screw right hand thread onto the tank. Is this what you have or do you have something different? A pic of what you have can help too. The newer switch over regulators have check valves in them on the infeed ports so you can remove 1 empty tank while the other one is still in use. What you are describing seems to point to that but again, I do not know what you exactly have. 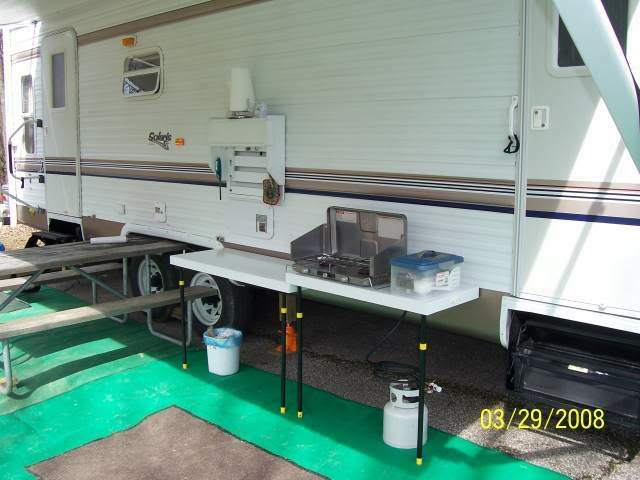 A camper as small as yours may only have 1 tank. I added pics above, John. It's a single 40# tank. The regulator was not mounted vertically, vent down as it should have been either. I'm leaning towards replacing the regulator anyway, but am still wondering about that fitting, what it is, and why it's stopping the gas. Before I jump to conclusions, can you take a few more pics showing your gas hook up at the tanks? And while you are at it, double check inside on the stove or the fridge, stove should be easier that the appliances are listed to be a 11" WC gas pressure. There should be a model number sticker with the requirements. The fridge sticker on the newer ones are just inside the door when you open it up. 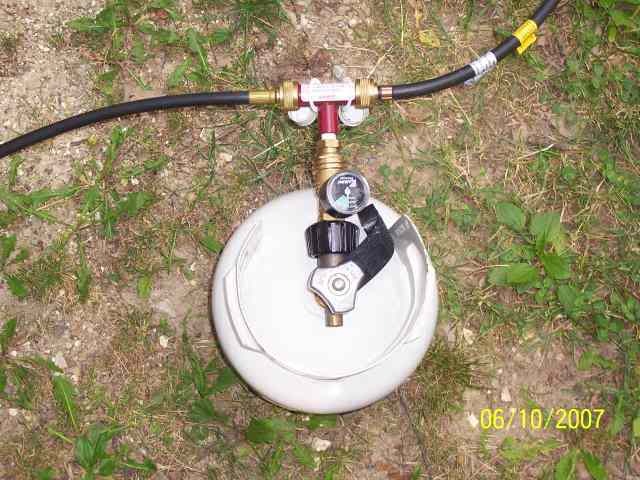 Need to see the tank, the regulator and if it has any hose etc before it heads to the main gas line on the camper. That Marshall 230 is not a 2 stage regulator and as such not approved for RV use. The prior owner may have installed it or it was before the code changed and now requires the 2 stage. The 2 stage requirement has been around a while. For sure a new 2 stage regulator is needed, they are not that expensive. Now seeing this need to see the tank pigtail and the fitting at the tank is the new type excess flow check type. They too are not that expensive. The pic of that fitting looks to be like an old style check valve. Need to see more of what you have to put all the pieces together. The Marshall Gas web site does not want to load up right tonight, but I found this on line. The 290 series is the 2 stage units. If you have 2 tanks then the 250 series. See page 11. Depending on your setup, the ACME type 1 green nut and hoses are there too. Just make sure you get the right hoses with the right fittings to work with the regulator. Some are NPT threads other use a flare swivel. PS They have special sealing tape for gas. Not the normal white Teflon you use on water etc. Lowes/Home Depot have the gas tape. Usually is yellow package but read the use label. Lots of good info there, John. Thanks. I'll get more pics for you tomorrow. I do have the single tank, so it will be the 290 series for me. There is rubber hose to the regulator, and copper between the regulator and the main line. No fridge, so I'll have to get the info on the stove. Didn't know about the tape. More pics tomorrow. Thanks again. Glad I asked. I know the mounting of the regulator isn't right by any means. In all honesty, I didn't even think about that until this problem showed up. We don't have much rain around here, but I know it would be easy to get any water in the system and screw up the regulator and who knows what! That will be changed ASAP. Also, I noticed that it's rated TW 25.3 lbs. I presume that's the filled weight of the propane itself? MFG date is 12 of '06 on the tank. OK now we see what you have. The LP tank is the new style tank. Good. A new 2 stage regulator and mounted so the vent points down and the regulator is vertical. Ideally this regulator is not hanging off the tank but mounted and held by other means than hanging off the tank by the plastic tank nut. You can use the down stream piping to hold it or a bracket of some kind. I know they make the regulator with the ACME tank nut on the end of the regulator, but in the case of a TT bouncing down the road being towed, hanging the regulator by the nut can crack the nut. Those combined ones are good for portable grills etc. not so on a TT from my experience. They also make a plastic cover for the regulator. See page 11 of the Marshal catalog. If you can get the regulator under cover but yet the vent is totally open to the outside, is best. Those of us with 2 tanks have a big plastic cover over the tanks and the regulator is under the cover keeping the rain and weather out of it. I would replace your gas pigtail hose completely. You have the old style POL left hand thread fitting and there is the messed up check valve on the end of it. On page 12 of the Marshall catalog they have the high pressure pigtails with a green ACME type 1 nut on it. Use this from the regulator to the tank or to your tank gauge. NOTE: You have to make sure that hose is rated at high pressure. 350 psi actually. It is full tank pressure upstream of the main regulator. With the new pigtail it has the new ACME type 1 excess flow check safety in it, has the fire saftey melting feature and you can use it with or without your gas gauge. I have had the gauges break the plastic nut before and had to replace them on my outside stove/BBQ. This way you can go direct to the tank if you end up broke down on the gauge while camping. Use gas leak solution or soap bubbles on all connections to test for leaks when you are done. BTW, I checked the stovetop and I didn't find a pressure rating on it, but it's the Wedgewood T212. Three burner, manually lit. Another question - about the gauge fitting. The hoses in the Marshall catalog don't appear to be adaptable to the gauge at the tank end where I have it now. Is that deceptive or will I have to put at the regulator end of the hose? I'm assuming I'll have to mount it at the regulator. The Green Type 1 Acme nut of the Marshall Brass pigtail will screw right onto your gas gauge. I even use it that way some times. The Gaslow and the brand you have ( I have them too) have an external and internal thread on the input end. Right now you have the old left hand thread POL all brass fitting screwed into the ID of the gas Gauge. When you convert, there are AMCE threads on the OD of the gas gauge that will be used for the new Green nut. Basically the threaded end that is on the LP tank is the same OD thread that is on the back of your gas gauge. If you look close you can see it. If I understand right, the new hose with the green nut screws on to the downstream side of the gauge? The black nut and gauge stay as they are? Or does the black nut come off (not budging by hand) and the gauge screw into the bottle valve like the hose is now screwed into the gauge? Sorry, it's a little confusing. Not that familiar with the fittings, as is apparent. As far as connecting the new green nut gas pigtail, you have a choice to do either. The green nut can screw right on the end of the gas Gauge and then the gauge unit screw to the tank. The only caution I would express is the towing a lot down the road with the gas gauge screwed to the tank and having the other Green nut pigtail hanging on it. I lost 2 of those GasLow gauges because the black nut split. And I am only screwing it on the portable tank and taking it off again after use. The heads up is the bouncing vibration of the weight hanging off the tank may aggravate a crack to start on your gas Gauge unit. I know it is not that heavy, but the normal RV tank only has a green nut and a hose hanging on it bouncing down the road. I only use the gauge on the big camper tank as a leak checker only. I use a IR temp gun with the furnace of HW heater running to tell a more accurate fill of the tank. There is a hot and cold change right at the liquid line. Just slow scan the tank and when a temp difference shows up, that is how full the tank is. Now that I have a deluxe tank cover it is hard to do this. I now just use the auto switch over indicator and keep an eye on it, when it just runs out and turns red at the end of a campout. I now know I have 30# more yet to go. When home I fill the spare tank and good to go again. I use about 1.5 tanks a year. And 3/4 of it in the winter running the furnace. Good info. Thanks again for all the advice, John! I think I'm pretty much set to get my gas system back up. I bought a two-stage regulator (single tank) and necessary fittings - including the 1/4" inverted flare female to 1/4" male NPT adapter for it. All I need to get now is the pigtail, and get it all mounted. My setup will require the 60" hose. I can get it locally, no problem. There appears to be two different hoses available - the 66-8921 (single tank?) and the 66-8781 (for two tanks). What is the difference? They both supply the regulator with tank pressure and have fire protection. Are dual-tank regulators that much different than single tank regulators (other than the extra tank connection), that the pigtail needs something extra? The dual-tank pigtail is generally cheaper from what I've seen. I would get rid of the ridged fitting between the regulator and the iron pipe also there is too much vibration there. TW is the weight of the empty tank. That sounds heavy enough to be a 30# tank. 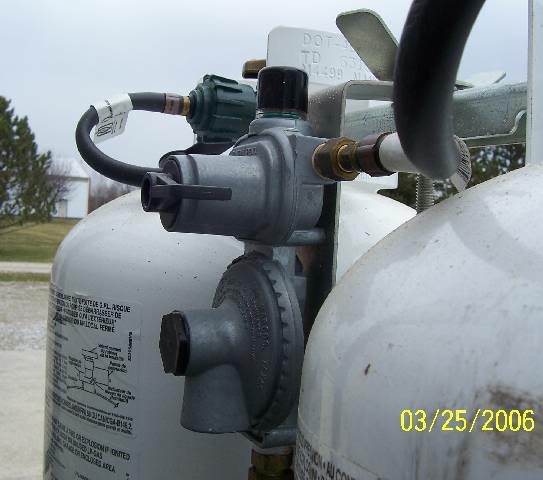 Propane is about 4.2# per gallon so around 7 gallons of propane would make the tank 55.3 # full . The tare weight is zeroed before the tank is filled.